Round 19 of the K League Classic brought goals goals goals. Jeonbuk Hyundai treated home fans to a sublime performance to extend their lead at the top of the table while the 2nd ever Suwon derby allowed one Olympic team star to steal the spotlight. Perhaps Jeonbuk’s best performance of the year, the Hyundai Motors were dominant in a 3-0 victory over Pohang on “Kim Bokyung night” at the Jeonju World Cup Stadium. Choi Kanghee lined up his side in a 4-1-4-1 formation, with Lee Ho as the defensive midfielder. Lee Jongho started as the number 9 in place of the injured Lee Donggook. Choi Jincheul’s Pohang also lined up in a 4-1-4-1, instead of their usual 5-back. The home side were simply formidable, right from the get-go. Lee Jongho was dynamic and quick, and assisted the first goal – Leonardo receiving his pass across the box and tucking the ball into the bottom left corner of the net first time. Kwoun Suntae was called into action around the 25th minute, denying a Kim Kwangsuk header off of a corner kick, and again 3 minutes later when Park Seonjoo’s cross wasn’t cleared by Olympic centreback Choi Kyubaek. Kwon was then forced into a double save in order to keep his quest for a clean sheet alive. On the attacking end, Jeonbuk were taking care of things comfortably. Lee Ho’s aggressive but tidy defensive midfield work allowed Kim Bokyung and Lee Jaesung to really flourish. We saw the forward-thinking, nimble Lee Jaesung dribbles that we have been deprived of this season due to his more defensive role, while Kimbo took the second half by the horns with a brace. First in the 48th minute when Lopes used his physicality in the box to maintain position and slide a box to the onrushing Kim, who coolly finished, and then later in the 56th minute, with Lee Jaesung incepting a poor pass out of defense and playing through the former Cardiff City man who wouldn’t miss this time either. Choi Kyubaek was mysteriously sent off in the dying minutes and Lim Jongeun gave up a penalty, but Yang Donghyun’s spotkick was saved and Jeonbuk preserved the clean sheet in spite of the last minute defensive breakdown. Notwithstanding that minor blemish, this was Jeonbuk’s best performance of the season and were a real joy to watch. They deservedly extend their 19 game streak without a loss and now have an 8 point cushion on top of the K League Classic. Kwon Changhoon was the difference in a refreshingly good performance from the Suwon Samsung Bluewings in the K League’s second Suwon Derby. 18,991 were in attendance for this intercity encounter. The Bluewings looked to dominate with a 4-1-4-1 shape, Kwon Changhoon and Santos both starting in midfield, while Suwon FC stuck to the 3-5-2 that allowed them to draw Jeonbuk last weekend. 16 more times would the Bluewings shoot at Lee Changgeun’s goal, with a lot of the work being done by the omnipresent Yeom Kihun and Kwon Changhoon. Lee Sangho also thought he scored in the 57th minute but his shot found the side netting, tricking everyone in the stadium and commentators convinced that it was a goal. It seemed like Incheon’s quest for three games without a loss would come to an end at the Guus Hiddink Stadium when Jung Jogook scored two in the first half. Joo Hyunwoo dribbled into the Incheon’s back three without much trouble and passed to Jung who scored his first; then Yeo Reum was brought down in the box after an errant backpass and Jung converted the penalty. However it isn’t over ’til it’s over and Incheon epitomised that once again. Kim Taesu and Lee Yoonpyo scored in the 75th and 80th minute to give Incheon a share of the points in yet another come-from-behind miracle. Jeju are without a win in 4 and have lost yet again to a relegation contendor after losing 2-1 to Jeonnam. Song Jinhyung got a touch from an early deep cross with Chung Woon to score his 4th of the season, but Jair scored his first goal in a Jeonnam uniform while Kim Younguk scored the Tavern’s Goal of the Week (below) to nick it for the Dragons in the 87th minute. 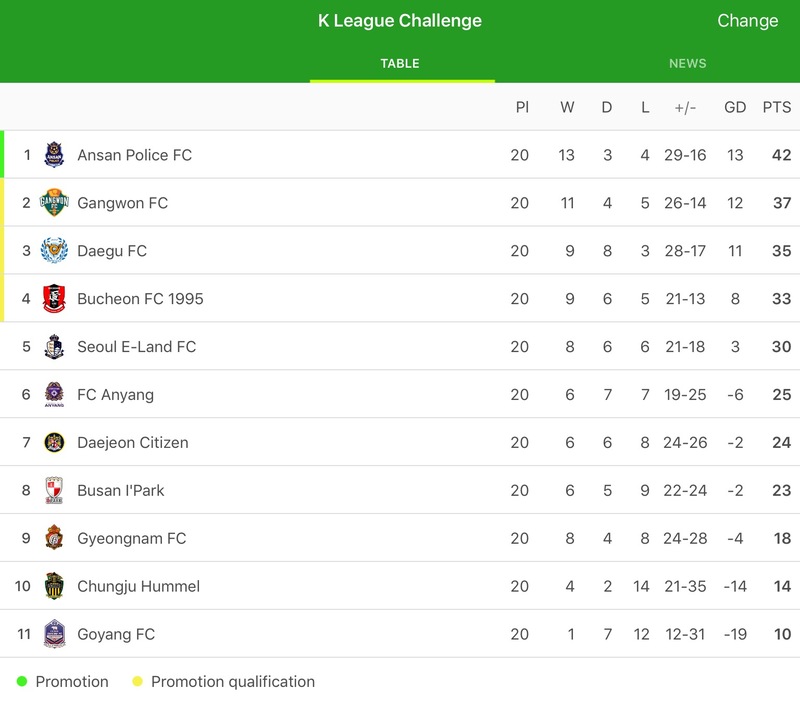 Sangju went fourth in the K League table after a dramatic 3-2 win at Tancheon Stadium. Seongnam skipper Kim Doheon was sent off after 20 minutes for two red-card worthy offenses – a horrific high boot and a blatant handball to deny a goal. Kim Sunghwan converted the penalty. Yeon Jewoon answered for Seongnam in the 31st minute with a great strike from distance on his debut. Sangju took the lead again with the end of the half, Park Juntae hitting a sweet half volley from Shin Jinho’s lovely lobbed pass. Hwang Uijo scored a free kick in the 60th minute to level the score once again, but Sangju’s sustained pressure finally dealt the winning blow in injury time. Kim Dongjun swatted unconvincingly at a cross and Kim Sunghwan scored his second with a volley into a fairly vacant net. Another offensive clinic from the Army. Pffft, possession? Ulsan went yet another game without a majority of possession and still took a well fought point away in Seoul. Adriano is serving a 6-game suspension for a violent elbow and Park Chuyoung came into the team in his place. However, without Adriano, Seoul just aren’t the same side and Ulsan had the lion’s share of big chances from set pieces or on the counter. Seoul’s best opportunities came through headers from Dejan but none were really clear cut. Both sides remain deadlocked in 2nd and in 3rd position. #KLeague Challenge recap: Gangwon, Daegu make up ground as Ansan shocked by Anyang. Daejeon lose at the death (duh) & ELand unbeaten in six. GK: Kwon Suntae (Jeonbuk) – Kept Jeonbuk’s first victorious clean sheet since the season opener – impressive double save and penalty save at the end. LB: Park Wonjae (Jeonbuk) – Tidy in defense and effective offensive contributions. Standout defender of the Jeonbuk line. CB: Lee Yunpyo (Incheon)- Scored the late winner for Incheon in yet another comeback victory. CB: Tomi (Jeonnam)- Positive, errorless start for the Australian on his debut. CB: Lee Jaesung (Ulsan) – Dealt well with Dejan in the air as Ulsan’s defense frustrates Seoul. RB: Ko Yohan (Seoul) – Unafraid to burst into the box. Should have done better with his chances but kept feeding Dejan and kept Ulsan defensive lines busy. LM: Kim Sunghwan (Sangju) – Two goals in a great win for Sangju. CM: Kwon Changhoon (Suwon Bluewings) – Delicious volley and constant threat all match long. CM: Kim Bokyung (Jeonbuk) – PLAYER OF THE ROUND – Deserved brace, great in Jeonbuk’s buildup, key in class win from Jeonbuk. RM: Kim Younguk (Jeonnam) – Big role in Jeonnam’s comeback win including fantastic goal. CF: Jung Jogook (Gwangju) – Despite Gwangju dropping points Jung Jogook was on his game again with two goals + crossbar to boot. The good: Kwon Changhoon was in fine form for the Bluewings, scoring a goal. The bad: Kim Dongjun’s distribution was terrible and he was directly responsible for Sangju’s winner. Lee Changmin and Lee Seulchan were on the bench and didn’t play. Shim Sangmin and Moon Changjin were absent from the squads. The average: Didn’t see much of Lee Chandong or Park Dongjin in the few minutes I tuned into that match too be honest, but from what I can gather it was an average night for them. Same for Park Yongwoo who played the full 90 for FC Seoul. The ugly: Choi Kyubaek got sent off (still trying to figure out why, happened off camera) and looked shaky in defense. He’ll miss the next two matches… and then he’s probably off to Rio. Oops. 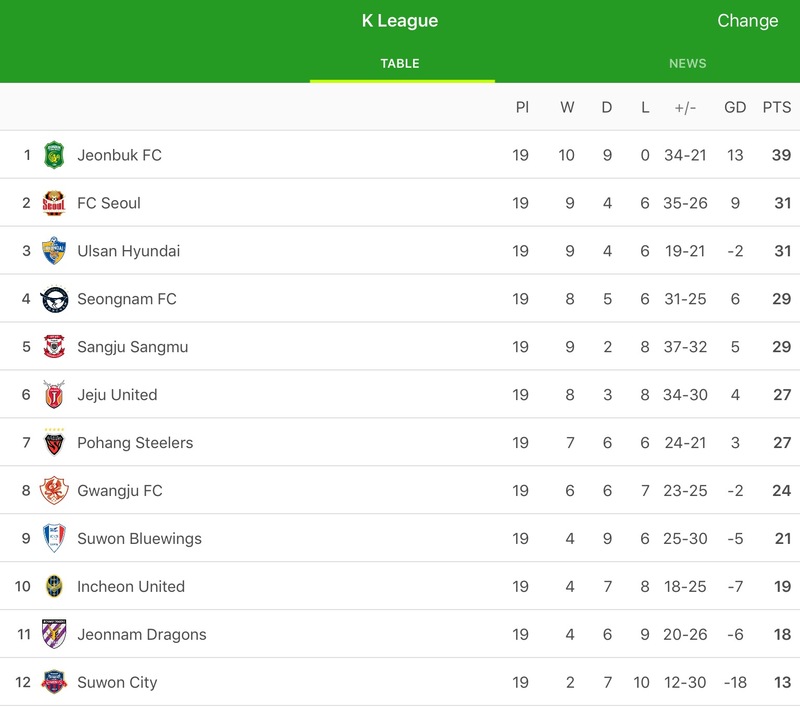 A battle at the bottom between Jeonnam and Suwon FC awaits, while Jeonbuk travel down to Jeju, where they have clinched their last two titles, in the hopes of extending their 8 point advantage. With only 4 points seperatist 2nd and 7th position, a clear challenger as yet to arise to the Green Machine with early challengers Seoul being caught up by the peloton as Hwang Sunhong searches for his first win. Much more excitement to come in these summer months as race for the K League Classic title continues!